Albacore’s mild flavor and firmer texture, hand packed in our Flavor Fresh Pouch®, makes it a great option for salads, pasta dishes or as a substitute for chicken in your favorite recipe. Because no draining is required, you can even eat it right out of the pouch! Delicious-tasting tuna you can really tear into! ++Our 2.6 oz. 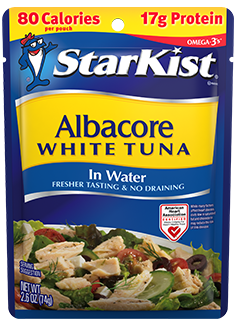 StarKist® Albacore White Tuna in Water has 160mg per serving of EPA and DHA omega-3s combined. ++Our 6.4 oz. StarKist® Albacore White Tuna in Water has 130mg per serving of EPA and DHA omega-3s combined.